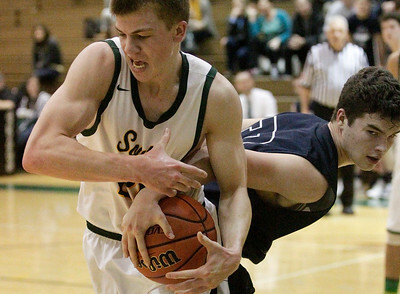 Matthew Apgar - mapgar@shawmedia.com Crystal Lake South's Zach Geske, left, and Danny Schmidt of Cary-Grove get tangled up as they battle over the ball during their boys basketball game on Tuesday, Feb. 2, 2016 at Crystal Lake South High School in Crystal Lake. 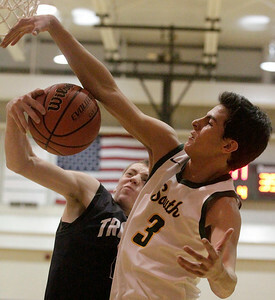 Crystal Lake South won the game 55-41. Matthew Apgar - mapgar@shawmedia.com Matthew Meyers of Crystal Lake South shoots the ball and gets fouled by John Walsh of Cary-Grove during their boys basketball game on Tuesday, Feb. 2, 2016 at Crystal Lake South High School in Crystal Lake. Crystal Lake South won the game 55-41. 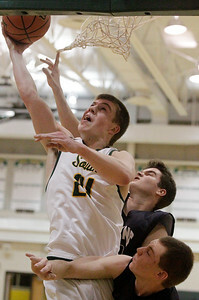 Matthew Apgar - mapgar@shawmedia.com Zach Geske of Crystal Lake South shoots a layup around Cary-Grove's Danny Schmidt, back, and Zach Beagureau, bottom, during their boys basketball game on Tuesday, Feb. 2, 2016 at Crystal Lake South High School in Crystal Lake. Crystal Lake South won the game 55-41. Matthew Apgar - mapgar@shawmedia.com Crystal Lake South dancers perform their routine during halftime of the boys basketball game between Crystal Lake South and Cary-Grove on Tuesday, Feb. 2, 2016 at Crystal Lake South High School in Crystal Lake. Crystal Lake South won the game 55-41. 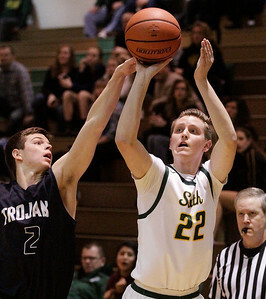 Matthew Apgar - mapgar@shawmedia.com Drew Murtaugh of Crystal Lake South sinks a basket and gets a foul call from Jimmy Clarke of Cary-Grove during their boys basketball game on Tuesday, Feb. 2, 2016 at Crystal Lake South High School in Crystal Lake. Crystal Lake South won the game 55-41. Matthew Apgar - mapgar@shawmedia.com Matthew Meyers of Crystal Lake South tries to snag the rebound with Zach Beagureau of Cary-Grove during their boys basketball game on Tuesday, Feb. 2, 2016 at Crystal Lake South High School in Crystal Lake. Crystal Lake South won the game 55-41. 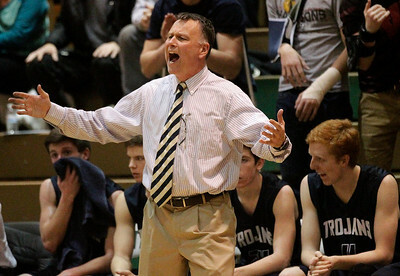 Matthew Apgar - mapgar@shawmedia.com Cary-Grove coach Ralph Schuetzle gets animated on the sidelines during their boys basketball game against Crystal Lake South on Tuesday, Feb. 2, 2016 at Crystal Lake South High School in Crystal Lake. Crystal Lake South won the game 55-41. 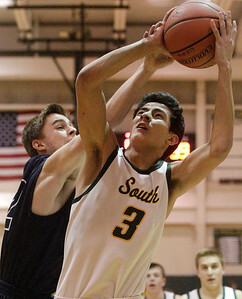 Matthew Apgar - mapgar@shawmedia.com Wes Buckner of Crystal Lake South shoots the ball past Danny Schmidt of Cary-Grove during their boys basketball game on Tuesday, Feb. 2, 2016 at Crystal Lake South High School in Crystal Lake. Crystal Lake South won the game 55-41. Matthew Apgar - mapgar@shawmedia.com Zach Geske of Crystal Lake South shoots the rebound in front of Zach Beagureau of Cary-Grove during their boys basketball game on Tuesday, Feb. 2, 2016 at Crystal Lake South High School in Crystal Lake. Crystal Lake South won the game 55-41. 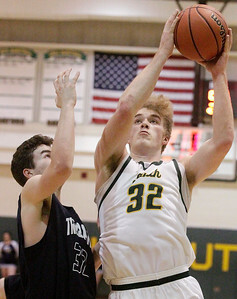 Drew Murtaugh of Crystal Lake South sinks a basket and gets a foul call from Jimmy Clarke of Cary-Grove during their boys basketball game on Tuesday, Feb. 2, 2016 at Crystal Lake South High School in Crystal Lake. Crystal Lake South won the game 55-41.